"Chicago Biennial shows how we find building blocks for new architecture"
This year's Chicago Biennial doesn't provide a blueprint for the future of architecture, but it does offer clues for how to create one, says Aaron Betsky. The fear of what the future might hold looms heavily over the second edition of the Chicago Architecture Biennial, Make New History, which opened in that city on 15 September 2017. The exhibition's name evokes the looming of the past, whose orders and achievements seem to overshadow our current attempts to make things new as we face a future in which not much good seems in the offing. If the exhibition, which has moments of great beauty framed by a blessedly low level of "discourse", succeeds in freeing itself from its name, it is probably because history means something different to us today. The exhibition unfolds in a moment in which history has became a data bank, not an order, narrative, or order to either inform or constrain us. Traditionally the past has been the weapon of conservatives and even reactionaries. It is so even today, but only in the alt-right world of hard-bitten, uncompromising neo-classicism as espoused by those battling the Eisenhower Memorial, and the implied racism and Reaganite dreams of the nostalgia-laden New Urbanists. To others, the past has been a story that teaches us how to act today, but few believe in such unquestionable morals. The past has also been a monument, a fixed presence from which we cannot escape, but these days we prefer to tear down such edifices. What Make New History espouses is an altogether more neutral story, one that is dedicated to two aspects of America's architecture culture that have distinguished its forms since the beginning of the 19th century: the omnipresence of the grid, and the desire to make our culture "real", with a material presence and its own history. This latter impulse dates back to the Colonial Revival that unfolded in the decades after the 1876 Philadelphia Centennial Exhibition. The Chicago Biennial is certainly a show of grids. Not only are quite a few of them on display, such as in the work of Design With Company, which looks at the combinatory possibilities of steel frame construction, but the display methods also establish grids, frames, and ordered pedestals that give subject what the architects have done to the ordering principles the curators, Sharon Johnston and Mark Lee, have devised. Moreover, the presence of the magician of grids, Ludwig Mies van der Rohe, looms over the proceedings. That in itself should remind us that the American grid, as opposed to, say, the German one that became an office building cliché in the 1970s, is in its essence open and democratic, inviting free action and expression within a framework that once supplied utilities and safety as well as an aesthetic order. The revivalist realism of the biennial is equally devoid of the terror of the already known. It takes the form of a strong archaeological bent. While the last Biennial, curated by Sarah Herda and others, found historical precedents in avant-garde practices of the 1960s and 1970s, Johnston and Lee look towards materials and forms that are more part of the real, as opposed to the white-bread colonial, vernacular. Their exhibitors give us many well-worn walls and ceilings, perhaps as a way to show that it is not abstract dreams or elitist form-making that should inspire us today, but the real stuff out of which our lives are made. There are no messages here, only remnants, fragments and snaps we can collect and manipulate. What the show risks giving up is the act of titillation, discovery, and even awe that we have come to expect from such large-scale gatherings of cultural gatherings since at least the first Venice Biennale in 1893. Here is good work, Johnston and Lee seem to be saying, that stands against the self-conscious weirdness and muscle-flexing, the rampant appropriation and the soaring skyscrapers cladding themselves in ever thinner skins; this is work that calls us back perhaps not to order, but to the to what Aldo Rossi (another ghost wafting through the exhibition halls) once called "certainly small things". Certainly it is not architecture either of the sublime or of experimentation, but instead of documentation and slight, at times critical, deformations. That does seem to be an accurate reflection of our current practice – and I do not mean the mindless reproduction of banality that constitutes nine-tenths of what we see going up around us. Following the grid through to scales and cantilevers previously impossible to construct is the go-to vernacular of big building, with a few fashionables folding and flowing those grids to turn it into blobism as a skin disease. In academia, the days of researching the most outre form are over as we dive further and further into the ways in which we actually make buildings, from life and safety codes to stud-wall construction, to find expressive possibilities in those building blocks of banality. It is perhaps telling that the only one of the super-tall residential buildings in New York to show any kind of integrity is Rafael Viñoly's unadorned pencil of grids soaring above all its competitors not only in height, but also in simplicity. This is where we have ended up: clarity and simplicity in instead of overt repression and revolt. So has Make New History captured the zeitgeist? It is too small and limited to be able to make that claim for it, but it certainly offers a salutary alternative to the purely reactionary statements such as David Chipperfield's misanthropic 2012 Venice Biennale exhibition. In the city that is supposed to make no small plans, this biennial offers us no plans, only a documentation of well-organised possibilities in maps, models, and photographs. 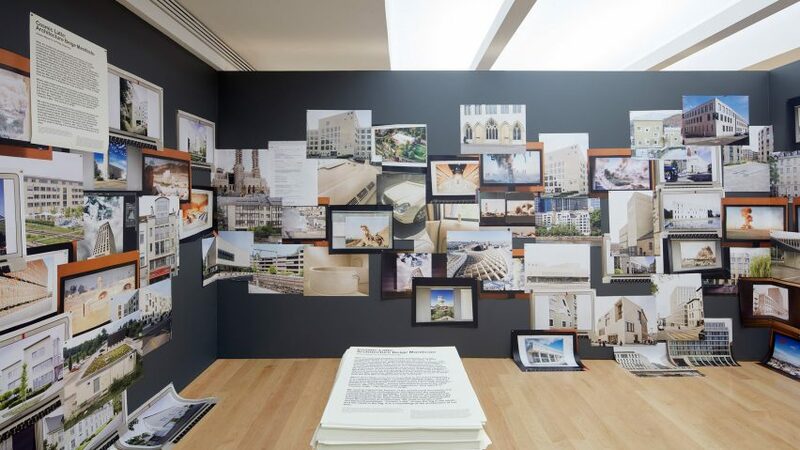 My favourite display was Jürgen Mayer H's Cosmic Latte Manifesto: a collection of buildings that are all beige, off-brown, or latte-coloured. This refusal at the idealism of white, this practicality of incorporating dirt into the building's facade, this desire not to offend or stand out, is what we see all around us. Mayer, who's best early building, a small city hall in the suburbs of Stuttgart coloured in stripes of brown that recalled both the 1970s and the clothes and accessories then being produced by Prada, but who has now turned towards tortured triangles and tree-like forms, proposes that we should make this vernacular our own and, well, do something with it. What, however, he does not say. That, for me, is the next step. This biennial calls us to order and turns us to the past, but it does not allow us to answer to the terror and the banality that threatens to drown us with false forms. Instead, it shows us what is all around us and how we might go digging through its detritus to find building blocks for a new architecture. Perhaps the next biennial will erect the scaffolding for such future-forming forms.